This is, remarkably, one of the best worst games of the current console generation. 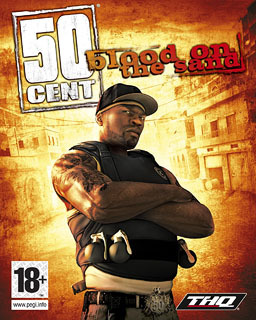 That's right, 50 Cent: Blood on the Sand is so incredibly bad that it actually winds up being good. In plot and dialogue, anyways. You play 50 Cent, or one of the G-Unit members, as you track down 50's diamond crusted skull. As our main player says at the onset, "$%@ took my skull!" Where gameplay's concerned, this game is actually pretty solid. The plot and acting, like I said, are wonderfully atrocious, but the gameplay is actually fun in its own arcadey right. Put a rap soundtrack behind Gears of War and crank the action up to high speed and that's what you've got in 50 Cent: Blood on the Sand. The entire thing is based on a high score system that encourages you to chain kills together, fight quickly and stay away from pinned down firefights. It works really, really well. I was convinced into playing this game by an old writing buddy from another site. We took the challenge on in cooperative style, something that's also incredible, and wound up loving every second of it. I bought the game within a month of its release at around $20. Now? It's selling for right around 10 bucks. The game was critically praised in all the right areas, and it was priced to move on day one. If you're looking for a light, easy to ingest, cheap third person shooter, this game might be for you.